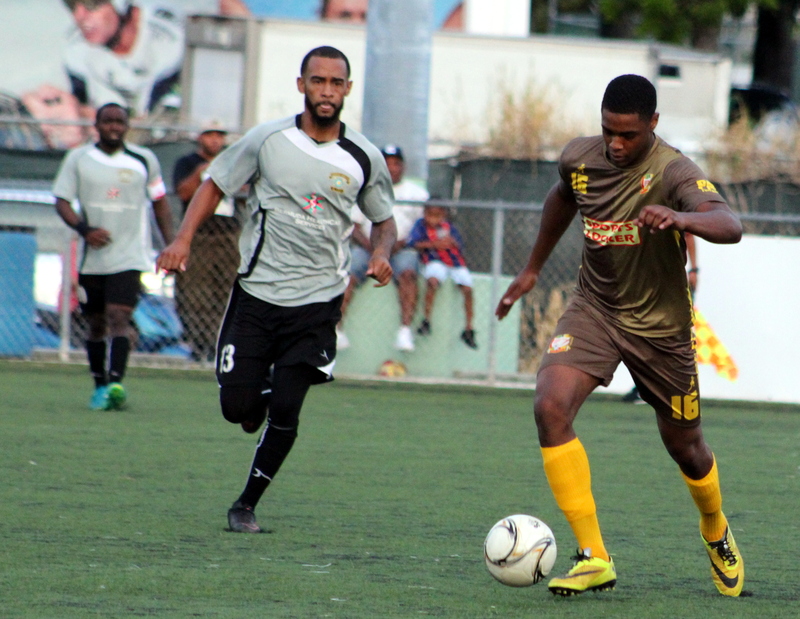 The Dandy Town Hornets were eliminated from the Dudley Eve Tournament following their second Group A match falling 2 – 0 to the defending champions PHC Zebras. The PHC Zebras would take the lead in the 25th minute when Marco Warren threaded a pass to Tre Ming whose touch fell into the path of Cecoy Robinson who calmly placed the ball pass an advancing Troy Hall in goal for the Dandy Town Hornets. Both teams created chances, but the second goal was the one that killed off the hope of the Dandy Town Hornets when Ming’s 20 yard shot in the 84th minute beat Hall to his right down low for the 2 – 0 win. Despite this heavy 7 – 1 defeat to Robin Hood the Somerset Trojans are still in with a chance of advancing to the Semi-Finals of the Dudley Eve, following their opening game win over the Devonshire Cougars. Robin Hood scored early and often in the first half and held a 5 – 0 lead at the break. Lejuan Simmons gave them the lead in the 3rd minute, he would go on and wrap up a first half hat-trick, Tomiko Goater and Antwan Russell would both add a goal each in the first 45 minutes. Robin Hood would get second half strikes from Philip Parsons and Christopher Ricca, while the Somerset Trojans lone goal came from Antoine Seaman.